Board Hibernation: The Period of time from February signing period till spring ball and after spring ball till preseason Magazines and 2 weeks after preseason magazines till camps begin. While not typical bear slumber periods they all last about 6 week durations. After those periods the bears (fans) can not wait to devour anything football so that first month of camp the boards (bears) awaken to challenge one another with our roar is better than yours and we try to frighten the opposition into submission. However, there will come a time for dominance we have to fight and bulk up for the next hibernation period of the board (play the games and recruit). Yep our fan boards are like bears and their cycles. Just not a great deal of things going on except the occasional debate where Central to South Florida begins and if there are any bears from that area that we would like to bring into our dens. 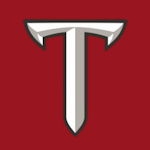 2) A nostalgia thread for troystet and doc to reminisce ad nauseum about the glory days of Troy State football and how we used to do it. 3) Tailgate Terrace, how it has devolved into one of the worst access, least desirable tailgate locations. 4) Women's basketball and the $50mil arena. 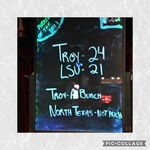 5) The City of Troy, Alabama, and a) The worst supporting locals in NCAA Athletics or b) The worst destination city in NCAA Athletics or c) The best small town NCAA destination for weekend forays to Panama City. 6) Sodexo and concession stands, that one's always good for a page or two of posts. 7) Ho's legendary, mythical story of what's his name who blocked all those punts. Haven't read that one in a few weeks. 8) What's his name and what Troy Athletics needs to be doing more/less of. 11) Why all of 'Barn's football players are bailing?? 12) Hotel/Motel policy on Football Game weekends in Troy. 13) Crowe's Fried Chicken, Then and Now! Ok so , there's lots to talk about. I, for one, am in favor of them. I agree that cycles are certainly a part of some posters on here. I got one to debate, what is better food, Burgers or Dogs? Coors vs Miller vs Bud? We had some good days. And I really can't remember how different Crowes was ... I didn't like it much when I went back last year. And, yes ... Rooks was good ... especially when they had an All you can eat night!!! How about adding the topic ... HOF on 13th and T-day on 20th (and letterwinner deal on 20th). So.....are burgers and dogs better when sold under a big tent ....like one large enough to practice under. So upside to burger and dog sales...dual functioning IPF. And in a semi unrelated discussion we can discuss how Ocala will be South Florida one day if global warming is correct?